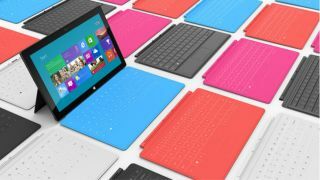 New rumours about Microsoft's upcoming smaller-screen Surface 2 tablet point to a 7.5-inch slate on its way from the Redmond crew. The word comes from NPD DisplaySearch, which also reckons that Microsoft's 7.5-inch slate won't hit until 2014. That's quite a way off in tablet terms. Competition amongst 7-inch tablets is already fierce with the Google Nexus 7, iPad mini and Amazon Kindle Fire HD leading the pack. But when it does land, NPD's supply chain sources say it'll be kind of a big deal. They say it will land with an iPad Mini-beating 233ppi pixel density (1400x1050 resolution) and analyst Richard Shim said, "Mass production is Q1 2014. Apparently, pretty significant volume. Multiple millions." He's clearly not a man to mince about with unnecessary words. As usual with analyst supposition, we're not entirely sold on this information - and we've already heard conflicting rumours, to boot. Last month, the WSJ reported that its Microsoft insider confirmed that the company is working on a 7-inch tablet for launch by the end of this year. In November last year, we also heard tell of a 7-inch gaming slate dubbed the Xbox Surface in the works, and Digitimes has also been in on the action with the catch-all report that Microsoft is working on both 7- and 9-inch tablets for a June reveal. June being when Microsoft holds its annual Build conference, of course, and we're all hoping for a Microsoft Surface 2 to launch alongside Windows 8.1 aka Blue. Whether that will be a cheaper 7-inch edition or something more in line with the existing 10.6-inch Surface, we'll just have to wait and see.